312 posts categorized "Children's Books"
Noodle sent me this infographic on finding your next children's book. The titles were suggested by the Kidlitosphere's own Betsy Bird, the New York Public Library's Youth Materials Collections Specialist. See any titles you like? I don't normally review non-book items, but this one snuck it's way in as part of a package from Tiger Tales, and became an immediate hit with Baby Bookworm. It's a little box with a carry handle that contains a 30 piece puzzle and a paperback alphabet book. The puzzle offers the perfect mix of education and fun. One side has the alphabet (upper and lower case letters, white on black) across the top and bottom. The bulk of the puzzle consists of vivid photographs illustrating each letter, with the word included in small text. The pictures selected are fairly standard (ice cream, xylophone, zebra), but they're also kid-friendly, particularly a huggable-looking teddy bear and set of rubber ducks. Most of the images are overlap across multiple puzzle pieces, so that kids don't need to understand their letters to be able to assemble this side of the puzzle. There's a picture of the full puzzle on the box to help. The other side of the puzzle just has the alphabet, in order, with one puzzle piece dedicated to each letter (upper and lower case), plus four blank corner pieces. The pieces all have the same matte green background, making it easy to tell which side of each puzzle piece should be facing up at all times. I expected my daughter (who will be three shortly, and loves puzzles) to favor the side with the photos. And to be sure, the side with the pictures is the only one that she can complete on her own at this point. But to my surprise, she is fascinated by the side with the letters, too. And she's learning. I've been using the book to help. When she wants to know which piece goes in a particular spot, I'll show her the page corresponding to that letter from the book, and let her pick it out. She's already starting to recognize letters that hadn't quite made it onto her radar yet, like V and K.
So yes, the puzzle is the exciting part of this package. But the little book that comes with it is quite handy, too. There's a page for each letter. Readers can see the letter itself, as well as a series of photos of things that start with that letter (including the one from the puzzle). This fits well with my child's current fascination with naming people and things that start with a particular letter. (The letter that her name starts with is her favorite for this activity, of course). The ABC Puzzle and Book is fun and educational, and comes in a sturdy, bright package. I would recommend it for home or preschool use for kids who enjoy puzzles, and for kids who are starting to learn their letters (bonus when this overlaps, as it does in my house). It would make a nice component to a third birthday gift, too. "Meet the new word-of-mouth publishing powerhouses: mom bloggers who share their online personal journals about motherhood. They post their thoughts and help sell books. And publishers are enthusiastically reaching out to them." My mention is about 2/3 of the way down (look for a link to "Growing Bookworms"), in the context of most mom bloggers having other day jobs, and also of reaching out to readers via Twitter, etc. Betsy Bird from A Fuse #8 Production is also quoted in the same section of the article, talking about people who consider themselves mom bloggers first vs. people who consider themselves book bloggers first. Since, like Betsy, I started blogging about books long before I became a mom, the latter is where I fall on that classification. "NPR and New York Times stories will never lose their luster—but they’re no longer the only show in town. For advice, moms turn to their peers. After all, mother knows best." Tomorrow (2/14) will be a big day for children's book fans! "Over 170 authors and illustrators and more than 40 independent booksellers in Maine, Connecticut, New Hampshire, Massachusetts, Vermont, Rhode Island, and New York are participating in Kids ♥ Authors Day. Bookstores will provide bunches of books, and authors and illustrators will personalize them, talk about why they do what they do, and answer any and all questions about writing and drawing." The January Carnival of Children's Literature is now available at Lisa Chellman's blog, Under the Covers. It begins, appropriately enough, with a collection of Wintry Reads. But the whole thing is a cozy, timely celebration of children's literature, with tons of great links. Don't miss it! New York, NY (September 19, 2008)—In a national laydown at 12:01 a.m. on Saturday, September 20th, Alfred A. Knopf Books for Young Readers, an imprint of Random House Children’s Books, will release BRISINGR, the third book in Christopher Paolini’s phenomenally bestselling Inheritance cycle. The first two novels in the series, Eragon (2003) and Eldest (2005), have sold 15.5 million copies worldwide. With a first printing of 2.5 million copies, BRISINGR is the largest first-print run of any book in Random House Children’s Books’ history and the largest for Random House, Inc., this fall. Inheritance fans young and old will celebrate across the U.S. and Canada this weekend as more than 2,000 book retailers have planned midnight-release events to mark its publication. 24-year-old Christopher Paolini will kick off his 10-city tour tonight in New York City and will spend the next several weeks meeting his North American fans. 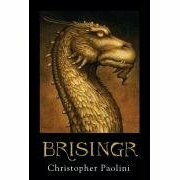 There are over 50 foreign-language licenses for BRISINGR, which is being simultaneously published by Random House’s sister companies in Canada, the U.K., Australia, and New Zealand. Verlagsgruppe Random House GmbH will publish the novel in Germany on October 25th. BRISINGR will also be released simultaneously in the U.S. and Canada as an audiobook by Random House’s Listening Library division. To build early buzz for BRISINGR, Random House developed a team-based immersive online game, Vroengard Academy (www.vroengardacademy.com) (often referred to as an ARE, or Alternate Reality Experience), offering players the opportunity to interact with a brand-new Inheritance cycle storyline by competing in weekly challenges and searching for online and offline exclusive clues. Over 50,000 players in the U.S. have already participated since the game’s launch in June. This marks the first time Random House has created an ARE to market one of its books. The game concludes next week. The grand-prize winner will have the opportunity to meet Christopher Paolini. Paolini grew up in Paradise Valley, Montana, where he and his younger sister were homeschooled. He began writing Eragon when he was just 15, after graduating from the accredited distance-learning high school the American School. Paolini’s family self-published the novel in 2002, and it was soon discovered by Knopf. The company acquired the series and published Eragon in hardcover in 2003, when Paolini was just nineteen years old. It quickly went from self-publishing obscurity to worldwide publishing phenomenon. Paolini will write a fourth book to conclude the Inheritance cycle. A publication date has not yet been planned. Personally, I enjoyed Eragon (though I didn't review it - I read it before I had started my blog), but thought that Eldest dragged a bit. I'm interested to see how this one turns out. And it does please me that Random House's biggest fall release is a children's book. Just to get the ball rolling for the soapbox discussions, Colleen listed a variety of issues that have percolating. The one that is currently getting under my skin (also discussed briefly in yesterday's Sunday Visits post) concerns the lack of broader knowledge about modern-day children's and young adult literature and the blogs that focus on that literature. This post stems partly from a post that Carlie Webber (Librarilly Blonde) recently linked to on the parenting blog Babble, and partly from my recent experience attending the BlogHer conference in San Francisco. The blog entry that Carlie cited is Where Oh Where is Superfudge by Rachel Shukert. And the gist of Shukert's post is that "Kids' books aren't what they used to be". She waxes nostalgic for several thirty-year-old books about "average kids with real-world problems" and suggests that "the Young Adult section has become ... downright aristocratic." She seems particularly bothered by the amount of press that Gossip Girl has received in the mainstream media, and the message sent by the Gossip Girl books and other similar titles. She laments the lionization of privilege, and says that "in the New Children's Literature it's the hapless middle-classes — the normal kids — who ruin the fun, through either graceless social-climbing or trenchantly decrying the excess and shallowness that make being wealthy so delicious, so desirable, so sympathetic." Her proposed solution is to "By all means, give them (kids) Gossip Girl, but rescue all those Carter-era stories of latchkey kids and public school and Native American girls abandoned on islands off the coast of California as well. For the littler ones, dust off Free To Be You and Me." Seriously? The best solution she can come up with to counteract the messages in Gossip Girl is to go back to 30-year-old literature? I have nothing against offering up the occasional classic to today's kids (if they enjoy it), and I am certainly in favor of providing kids with a diversity of literature about people of all races and classes. But ... hello! There are hundreds of current books that fit the latter description in bookstores and libraries today. I don't mean to criticize Rachel Shukert. I think she's trying to do something good. She sees all of the books in the bookstore and on the NY Times bestseller lists that feature unattainable wealth, and she wants something more realistic for kids. The thing that frustrates me - that keeps me up at night -is that people like Shukert are steering their children towards older books (however lovely those books are) because they don't know about what's available today. While at the same time the children's book blogging community is filled with people writing in-depth, thoughtful reviews of current titles, and jumping up and down to help parents find these titles for their kids. There's a disconnect here that simply MUST be addressed. This past Saturday I attended one day of the BlogHer Conference in San Francisco. It was a lot of fun - you get a great energy going when you have 1000 women in one place who are all passionate about blogging. I met a few nice people, with whom I will be be following up, and some of those people were interested in the idea that I blog about children's books. But I have to admit that overall I felt marginalized at BlogHer. There seemed to be forums for mommy bloggers (by far the biggest sub-group), craft bloggers, personal bloggers (people who share their thoughts and/or details about their lives), and tech bloggers. But I certainly didn't meet any other book review bloggers (children or adult), and I didn't find a whole lot in the sessions that spoke directly to the type of blogging that I do. (Anne-Marie Nichols was there, but by the time I learned of this, it was too late to try to meet her, and too big a conference to find her at random). It was a far, far cry from the Chicago KidLit conference, and even from ALA (although ALA is a much bigger conference). The place I was most comfortable, people-wise, was the PBS table in the exhibit hall. I'm not blaming the BlogHer organizers for my ... disconnection with the larger conference. I think that they do a great job of organizing. I was probably not there long enough to really get comfortable (I was unable to stay for the evening social event), and I didn't try hard enough to meet people. I also think that if I want the Kidlitosphere to be part of the larger blogging discussion, then perhaps next year I need to get some people together for a panel (or someone does). Because here again, similar to the situation with the Babble post, we have a whole bunch of people who blog, many of whom are passionate about how they are raising their kids, and as far as I can tell, they have only the vaguest notion that children's book blogs exist. And that's a shame. Because we do have some amazing resources here in the Kidlitosphere. I don't have the answers, in terms of making the Kidlitosphere more broadly known. I think that the general issue is that doing that is going to require time, and many of us are already spending all the time we can on our blogs. We're hardly looking to take time away from the blogs themselves, to reach out to other people, people who don't seem that interested anyway. I feel like I have this magical room full of free stuff, wonderful stuff that gets automatically replenished every day. And people are walking by outside of my room, people who would love this stuff if they knew about it. But they don't happen to look inside, and I don't have time to stand by the window to ask them to come in. Observations: I was very dedicated. I spent as much time as I possibly could on this challenge. I didn't do laundry, unload the dishwasher, or cook at all during the 48 hours. I did sleep, and I did shower, but I ate most of my meals quickly, and Mheir was severely neglected (he rented himself some violent movies, and played golf). Sadly, I had to attend a dinner event on Saturday which, though lovely, cut out my reading time after 5:00 pm that day. I tried to read when I got home, but the combination of an early day and wine at the dinner made this largely unsuccessful. But apart from that, I read and reviewed just about as much as I could. I ended up spending just slightly under 24 out of the 48 hours on the project. Not a bad ratio, if you take sleeping into account. The thing that kept me from reading more books was that for the life of me, I couldn't give the reviews short shrift. I normally spend about an hour per review, and I did manage to cut that in half, but I just wasn't willing to cut it any further. These were great books! They deserved to be talked about. And it does please me immensely to know that, after the past couple of months of writing fewer reviews than I would like, I was able to publish 11 of them this weekend. They aren't quite as full-fledged as I would normally do, but I feel like they're good enough to give people an impression of each book, and help people decide which ones might be a fit for them. So how do I feel about the challenge? It was stressful, a bit, concentrating so much on one thing, at the expense of others. (Of course it didn't need to be stressful, but my competitive spirit came to the surface). But it was also exhilarating and validating. Too often, I let all of the other responsibilities in my life push reading and reviewing aside. There are many days in which the only reading I do is in bed, before I fall asleep. And when life is busy, that sometimes amounts to barely a few pages. This weekend reminded me how much I love to sit down and read a book cover to cover, in one sitting. It reminded me of how much easier it is to write reviews if you write them immediately, while the book is still fresh. It reminded me of how many amazing and different books I have on my shelves, and how important it is for me in terms of my own happiness to make time to read them. Immersing myself in stories is what I love to do. I also love to share those stories, the best of them, with other readers through my blog. This weekend has convinced me that I need to make reading more of a priority all the time, not just on 48 Hour Book Challenge weekend. I'm thinking of setting aside one day a month to have my own personal 24-hour Book Challenge (because 48 hours in a row is a bit tough on Mheir). I'm not sure if I'll really be able to do it, without the additional motivation of a "contest". But I'm going to try. Pam, I can't thank you enough for the gift of this weekend! I don't need any prizes (though I wouldn't really refuse one) - my stack of 11 read and reviewed titles feels like quite enough. I'm already looking forward to next year. And I plan to start with Suddenly Supernatural: School Spirit. The weekend is June 6–8, 2008. Read and blog for any 48-hour period within the Friday-to-Monday-morning window. Start no sooner than 7:00 a.m. on Friday the sixth and end no later than 7:00 a.m. Monday. So, go from 7:00 p.m. Friday to 7:00 p.m. on Sunday... or maybe 7:00 a.m. Saturday to 7:00 a.m. Monday works better for you. But the 48 hours do need to be in a row. For those looking for a bit of enjoyable weekend reading, the May Carnival of Children's Literature is now available at Here in the Bonny Glen. Melissa Wiley is the original creator of the Carnival of Children's Literature, and when she put out a last minute call for submissions this week, people responded promptly and enthusiastically. Melissa has put together an entertaining collection of links about children's literature, with particular emphasis on reviews. Head on over and check it out!